Donate used clothing and household items to help women and children escaping domestic violence and homelessness. Things you no longer need are reused and kept out of landfills. 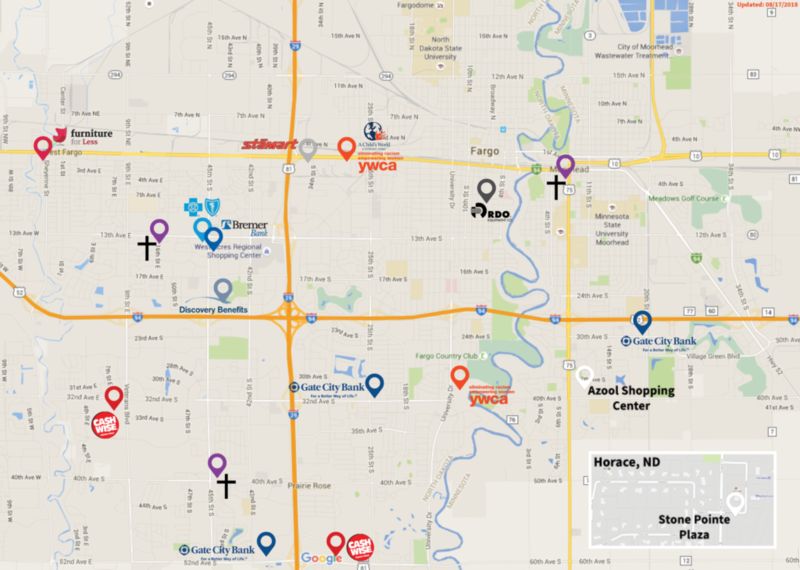 YWCA Donation Bins are placed throughout Fargo, Moorhead, West Fargo, Horace, and at YWCA. You can drop items at any hour of any day. Often women come to the YWCA with nothing – an unfortunate reality. Donations to YWCA are sorted, and we keep what’s currently needed. Items we don’t need or can’t store are taken to a local thrift store where every item counts toward shopping vouchers for families AND contributions for YWCA to continue to help families in need. Women we serve then use these vouchers to shop for clothes from the thrift store’s wide variety. The shelter accepts donations during the weekday hours of 8am-5pm. A bin is also outside the shelter for your convenience. All furniture or large donations must be pre-arranged with a designated staff member due to space limitations.Call 701-232-3449 and allow up to 48 hours for a return phone call. Thank you for your enthusiasm to help women and children in crisis. A donation drive at your business, club, or church will make a valuable difference to women changing the course of their lives. Things we may take for granted are vitally needed by women escaping domestic violence and poverty. There are typically 65+ women and children at the emergency shelter, and another 75 in our supportive housing and human trafficking units – and they need many practical items. Most things? They’re exactly the same as those you need for your own health and hygiene, or to run your own home! Beyond the items we need all the time there is room to get creative. A particular time, we might need women’s bras and underwear (new, with tags on), or seasonal items for our kids at the shelter at Christmas or swimsuits and sunscreen in the summer. If you want to hold a drive that’s themed around particular needs rather than a general donation drive, contact the YWCA Volunteer & Donations Coordinator at volunteer@ywcacassclay.org or 701-232-3449 for current needs or ideas particularly suited to your team! We want your giving passions to be fulfilled as practical items are supplied for women and children. How do I plan a drive with YWCA? Contact Volunteer & Donations Coordinator at volunteer@ywcacassclay.org or 701-232-3449 to alert us about your drive and gain last-minute needs or ideas. Request a YWCA logo if you want one for posters and promotions. If you wish, we can provide fact sheets about the shelter. Or we can come and talk to employee groups about our inspiring mission. Finally, discuss with Laura a drop-off date to plan smooth delivery to the shelter. We like to recognize these gifts and often announce them on our social media.